It’s crazy that I’m in the double digits of training. Week 10 had a hiccup at the end but I made it through relatively unscathed, lol! 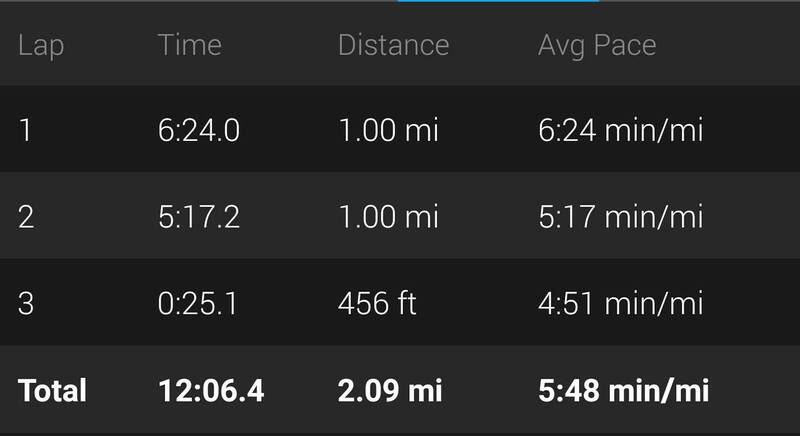 Easy miles around my neighborhood. I’ve been listening to music on my easy runs and I put in one of my favorite Spanish rock bands in Pandora. It’s ended up being a great station for my easy runs because I just zone out and run an easy, relaxed pace. I don’t have to to think about it and I never even look at my watch when I run. I’ve been doing my speed work in the evening which means battling the heat, but I’ve found that I’ve still been able to hit the paces so it works. The downside is that I’ve neglected my warm ups and cool downs because of the way the route is laid out. 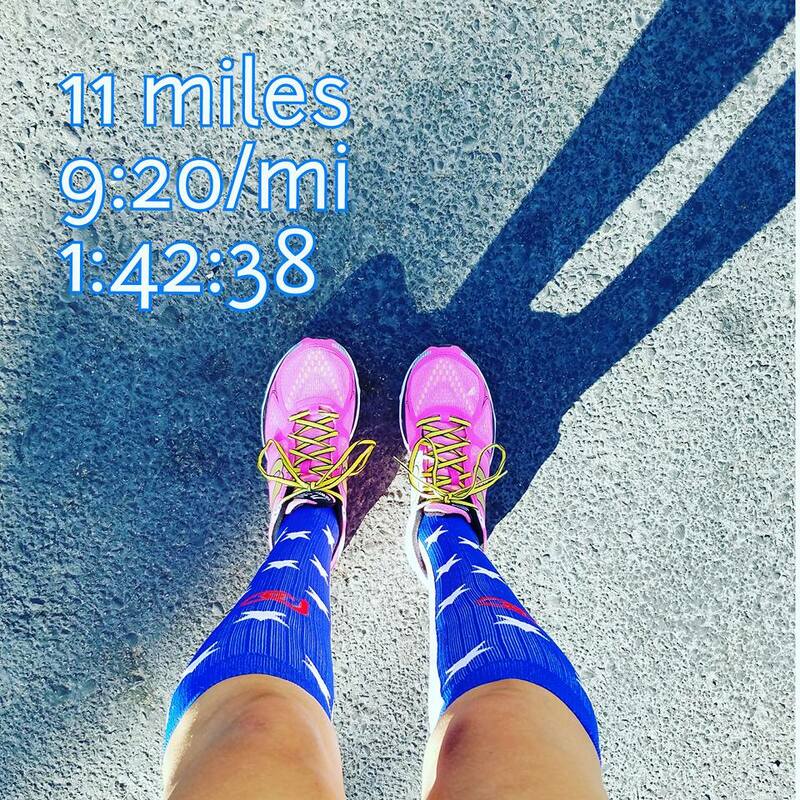 As the training plan moves on from speed to strength runs on this day, I’m going to be more strict about getting a full mile in for each even if it means having to figure out a new route. It was a “rest day” but I’m in a Step into September challenge (10k steps a day) so I took the family to my group run’s track day. 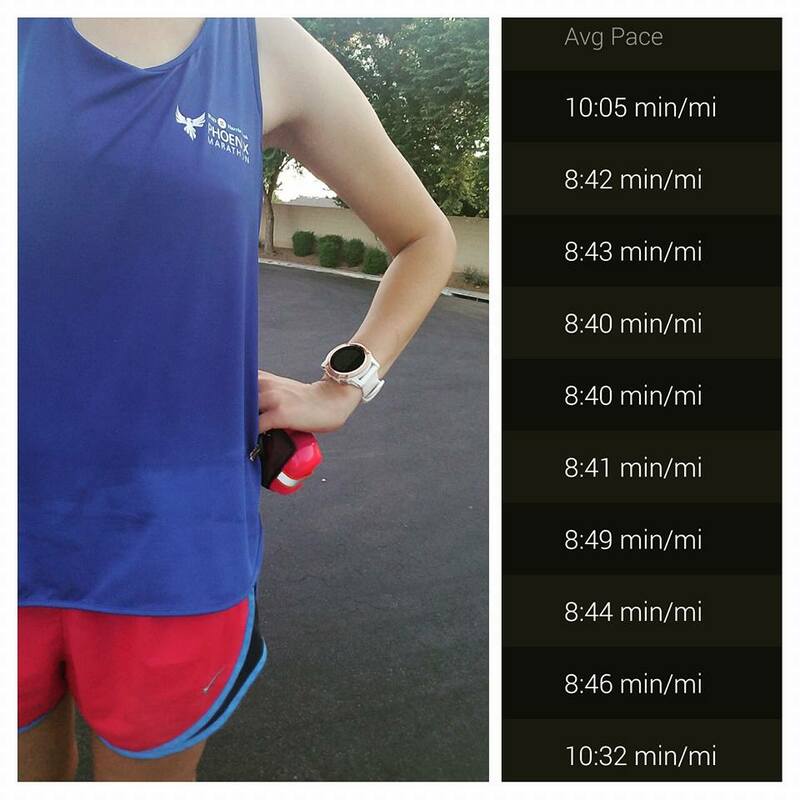 I had already done my speed work the day before so I just ran around after my kids. 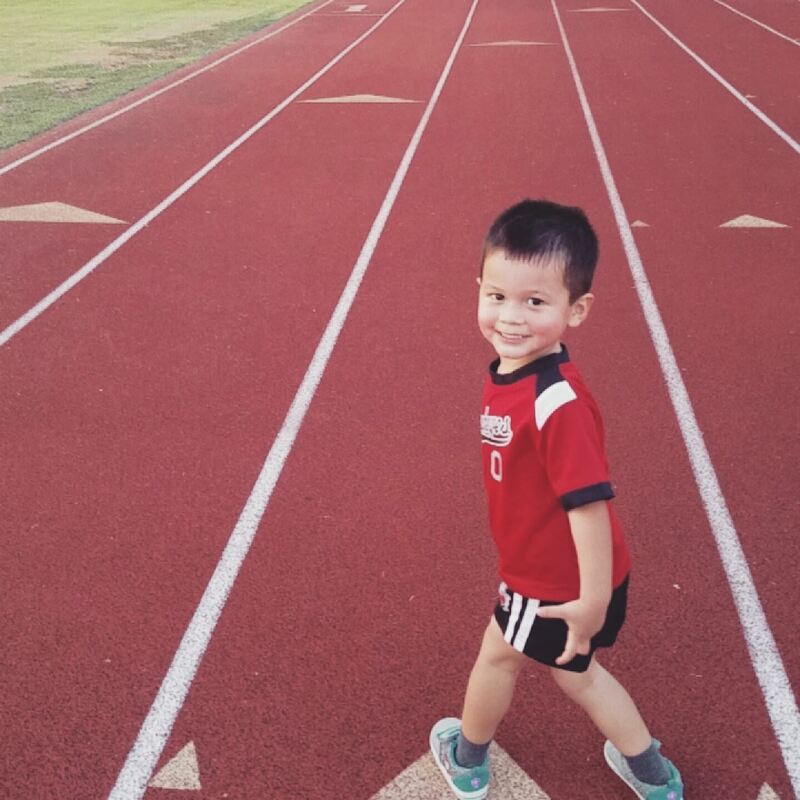 My son ran a 4×400 little workout for his FIRST MILE EVER!! This was a CLOUD 9 run. 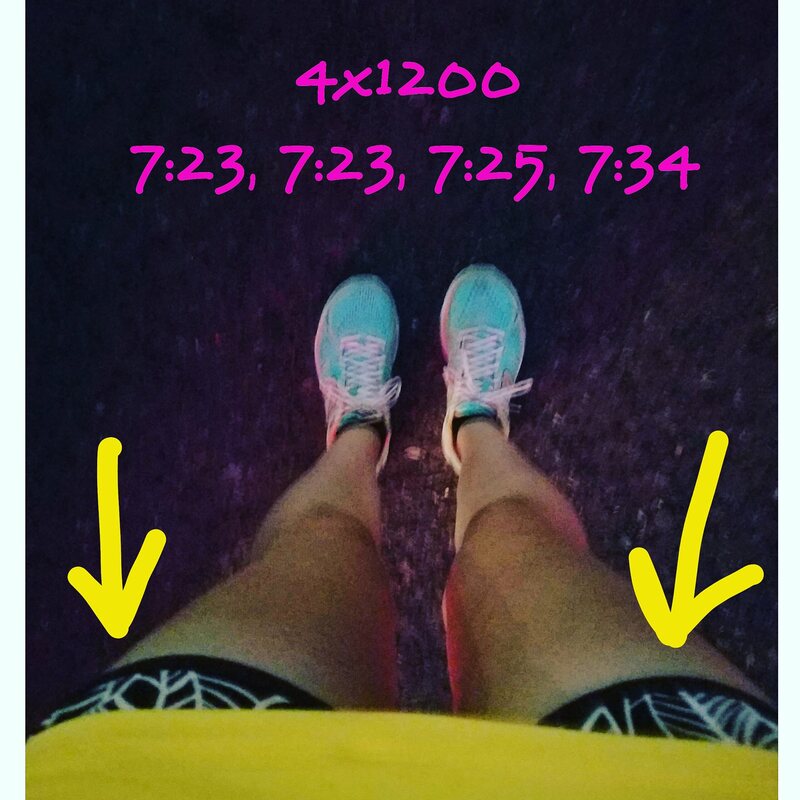 I felt good the entire way and was so happy with my splits. They were beauties. It was a super early wake up for this run. I had to leave my house at 4 to get to the meet-up spot at 4:30. That meant a 3:30 alarm….oooof. The things we do for running. Things went horrible south with this run. It was an important one as I was running/pacing my good friend Jen on her 20 miler (I was going to do 10 for my long run). But 2 miles in, I stopped abruptly and clutched my stomach. Jen immediately knew something was wrong because I never stop mid run like that. My stomach was wreaking havoc and there was not a bathroom in sight. It was dark out (we started at 4:30 a.m.) and I thought we were about a quarter of a mile from a nearby park—but we weren’t. It was still about a mile away. I walked. Tried to run. Walked. I told Jen and the others (thank goodness she had others with her) to go on without me. They would run for a while and then wait for me to catch up. I felt a little better after I used the restroom but with it being mile 3 of my friend’s longest run of her training, I didn’t want to mess things up for her so I told her I was going to walk home. It was closer than walking back to my car. So at 5 in the morning, I walked/ran home feeling sick, sad, and defeated. I wanted so badly to be there for my friend. After hydrating and getting a really good night’s sleep (finally), I woke up feeling a lot better. My husband got in his long run first and I went immediately after him. I got in 3 miles solo as I ran to meet up with a friend, got in 6 with her, then I ran 2 miles to a nearby McDonald’s where my family was having breakfast. It was a fun, and thankfully, easy and uneventful run. –Have you gotten sick mid-run? I keep telling myself that at least it wasn’t during a race. I hope it DOESN’T happen during a race, lol! 3:30 am????? YOU ARE MY HERO OMG. Great job last week. You fkn NAILED that tempo run. Those are the runs I struggle with the very most. I’ve done really well with the tempo runs which make me feel a lot better about this goal (that I sometimes think I overreached). And YOU are MY hero. So effing inspiring, seriously. Sorry to hear about you getting sick in the middle of a run. It rarely happens to me, so when it does happen, I’m shocked and don’t know what to do. Better in a training run than in a race. Your tempo run was pretty sweet. Can’t wait to see/meet you in Nov.
That’s exactly what happened to me–I had no idea what to do! I’ve never gotten sick like that before. If I actually wanted to run before work, 3:30am it would be. That is why I run after work. I’ll take the extra heat and humidity, thank you very much. :p You are a glutton for punishment! If I was still working, it would always have to be 3:30 a.m. The fact that I’m doing it voluntarily (b/c I’m not working right now) definitely shows my gluttony for punishment, lol!! I used to run about 5:15am every morning and most days would need a “pit stop” on the way. I sussed out it was carbs causing my stomach upset, bread, rice or pasta would cause it. Since going carb low it’s never happened but it’s all down to each individual so could be anything! It had happened a few times in races too and that’s interesting. Never leave the house now without water and toilet paper! I would totally prioritize carb stuffing at Disneyland!! Oh I almost got sick on one of my last long runs…JUST made it home in time! You sure did have a great week despite Saturday’s tummy troubles. I love that you and your husband are both training! My husband is running the half this weekend (I downgraded to the 5k) and I’m SO excited for him! Unfortunately, I know that sick feeling all to well. Sorry you had to experience it! You still had an amazing week though! My lord I can’t believe you got up that early, you’re an idol! i got up at 5.30 for a long run, and that was the biggest struggle, I don’t know how you do it! LOL! You kinda get used to it–I want to avoid the heat and plus I have to get back in time for my husband to go to work. What a week! So sorry to hear about your sick stomach on the run. It happens and usually at the most random of times. Frustrating. But it is in my opinion, always good to face these obstacles. Then if it happens on race day you can tell yourself to relax, you’ve been there before and you will find a solution. Ugh, so sorry you got sick during your run! Other than that, you had a fantastic week of training. I think I write it every time, but every week when I read your training I am so impressed with you hitting your workouts and your paces and just your overall dedication. Your tempo runs have been killer and you are going to feel so strong in NYC. Another awesome week! Great job this week!! 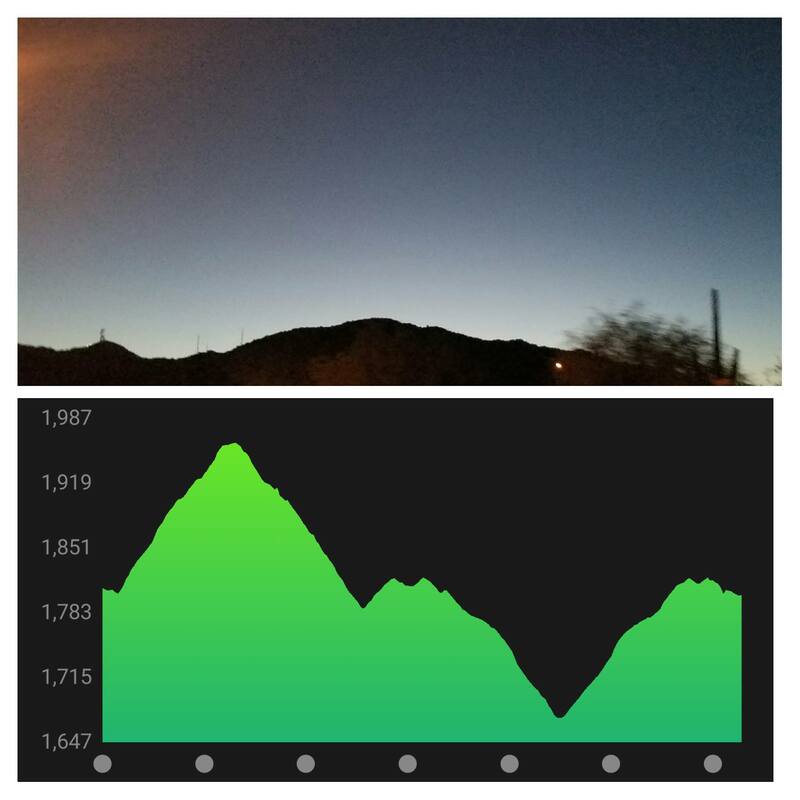 I don’t miss getting up at 3:30 to run, but sometimes you have to! Nice work! Hopefully, that stomach thing is done! I remember doing a 16 miler on a busy-ish trail a couple of years ago when nature called and simply had to be answered. Thankfully it was an once-off! Who knows if you just caught a random bug, but the rest of your week was killer so focus on that awesomeness! Thank you so much!! I think it was a random bug. Since my daughter started school, we’ve all had a random sickness here and there and I think it was just my turn lol! Now this is dedication! Awesome work!!! You are crazy….awesome!!! Well done girl! I recently had a horrible long run testing some new gels. NEVER EVER again. Worst feeling. I’ve been put off gels forever I think.